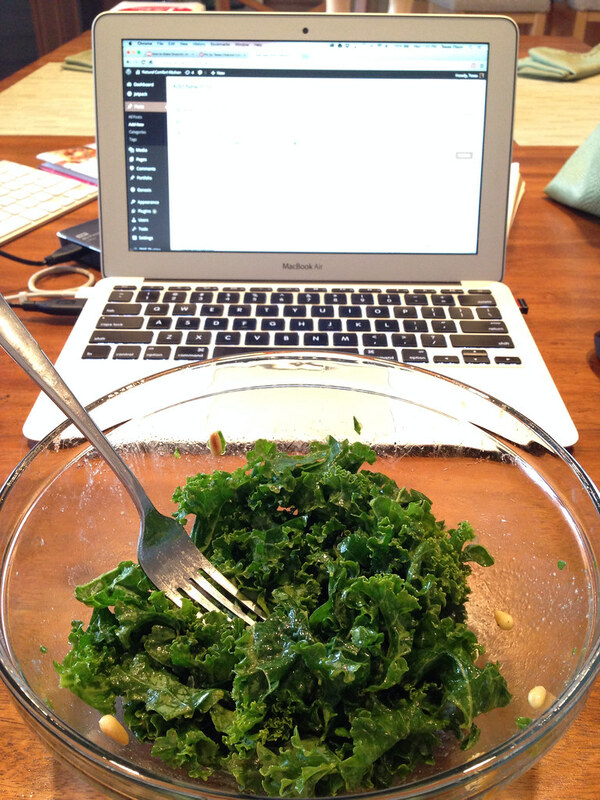 Sometimes you want a cleansing meal that’s not…kale salad. Sorry, I pick on kale salad a lot, but the truth is, I’m eating one right now. It’s more of a mental hurdle for me to elect kale salad over something warm and cozy and possibly cheesy. Something that very closely resembles authentic, floury spaghetti noodles with which I used to be intimately familiar. Now I’m much more acquainted with spaghetti (or any winter) squash. Our relationship started out…rocky, at best. It’s a lot of work and mess (or so I thought), to seed, prep, bake, and then dissect each individual strand from the rock solid, dangerous to cut through exterior. Or, take butternut squash. No matter how laced with cream and salt, I habitually rejected any taste of it in soup form for years, yet somehow now we’re in love. Yes, the soup does love me back, I’m convinced. I wouldn’t say I’d choose the complex sweetness of squash any day over conventional pasta, but definitely 90% of days. And today is one of those days. Inspiration for the recipes I post on my blog comes in many formats. Sometimes I start with the end in mind, and I work my way there, often photographing, recipe writing, and testing all in one shot in the kitchen. It’s a lot to keep track of and often ends with me in a nearly-tearful pile on the couch watching Pioneer Woman and eating cheese. 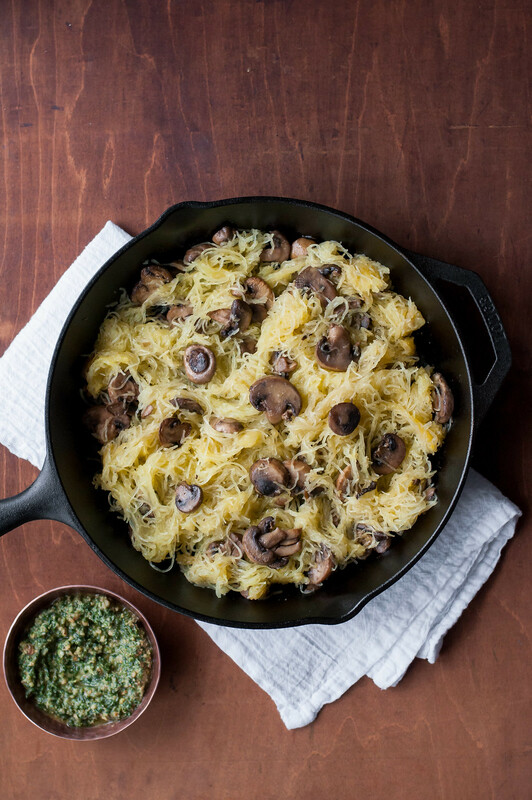 Then there are recipes like this spaghetti squash, which stem from necessity, then move into the “hey, that was kinda good, let’s make it again” phase. For the record, the latter is my favorite way to cook. I don’t think about how it would look here or on Pinterest or what Instagram caption I would give it or what props to use for the photos, I’m just cooking. Which tends to make recipe documentation a little bit tricky. I have zero clue what ratio of pesto ingredients I used–I only know that it was scrumptious and I had to make it again. And luckily, by the third repeat, I figured out that ratio. Once upon a time when gluten was a household staple, around Thanksgiving, my mom conducted a food-centered exercise in gratitude. For two consecutive weeks preceding Thanksgiving, dinner was spaghetti, meat sauce, and breadsticks. Every night. It’s easy to deduce, but her goal was for us to appreciate the abundance and variety of our food. I, for one, didn’t have any big complaints about all that spaghetti and good ol’ Ragu (hey non-Italian Minnesotans), and routine resonates with the core of my being, so I don’t remember if I started protesting by night 11 or not. However, the experience was memorable, and looking back on it helps me stay grateful to this day. Good work, Mom. My sister’s fiance was fascinated by the pre-Thanksgiving spaghetti story and insisted that they try it this year. Since gluten in that quantity would cause all sorts of problems for our digestive endeavors after reducing it substantially in our diet, she had the smart idea to use spaghetti squash. I’d just like to note (and warn my household) that I’m jumping on that bandwagon next Thanksgiving. 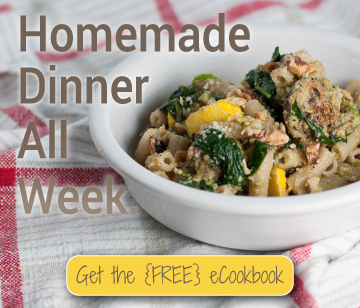 Two weeks of inexpensive, simple, easy dinners. Maybe I’ll even bring back the Ragu for old times’ sake (or not). Anyway, when I visited Toryn and Kolby in Oklahoma just after Thanksgiving, a few lone spaghetti squash lingered on the countertop. As did a Costco size bin of sliced mushrooms in the refrigerator. For about 20 hours straight, my wheels were spinning with possibilities for the squash and mushrooms. I presented Tor with the pilot run of this dish for lunch after her half day of teaching the Monday after Thanksgiving (pictured here), and a few remakes later, we have this. Aside from the therapy provided by its preparation, the pesto also doesn’t require a food processor. I’m touting that as a perk, but at the time, I thought the lack of food processor in Tor’s kitchen was an obstacle standing between me and pesto-coated strands of pale yellow, steamy squash. Then I realized: pesto has probably been around longer than food processors. So I got to work with one of my favorite kitchen tools: my chef’s knife. Plus, and very beneficially, a fine grater for some lemon zest and parmesan cheese. The thick, herby pesto came together so beautifully that I may never need my food processor again (lies). Unlike jarred pesto, which has its place during a frenzied work week or busy holiday season, you know this one is fresh. You can taste that it’s fresh given that first pop of bright lemony tang. You’ve heard it all over Food Network and every food periodical, but the key to a good dish is balance of flavors. It only makes sense, then, that the zippy lemon works well with sweet, mellow, slightly crunchy squash; earthy, tender mushrooms; salty parmesan cheese; and luxurious olive oil. Taking a little time to slow down, hand grate cheese, chop the living daylights out of your favorite herb, and find some release in demo-ing nuts with a rolling pin couldn’t be more rewarding. Keep things simple and mix the components all together in a single skillet (bonus points if you can come up with a way to roast the squash in that same pan). For extra visual appeal and some added fun, top with shredded mozzarella and broil until golden. Depending on your appetite, and whether your body is accustomed to fueling with gluten-free, vegetarian food, you can play with the quantities below–they’re flexible. For me, a fourth of the below recipe is enough for dinner, but Steve ate about half the pan before he got full. For a house full of adolescents, I might double the recipe. You can easily get away with fewer mushrooms and less pesto for the same amount of squash, too. 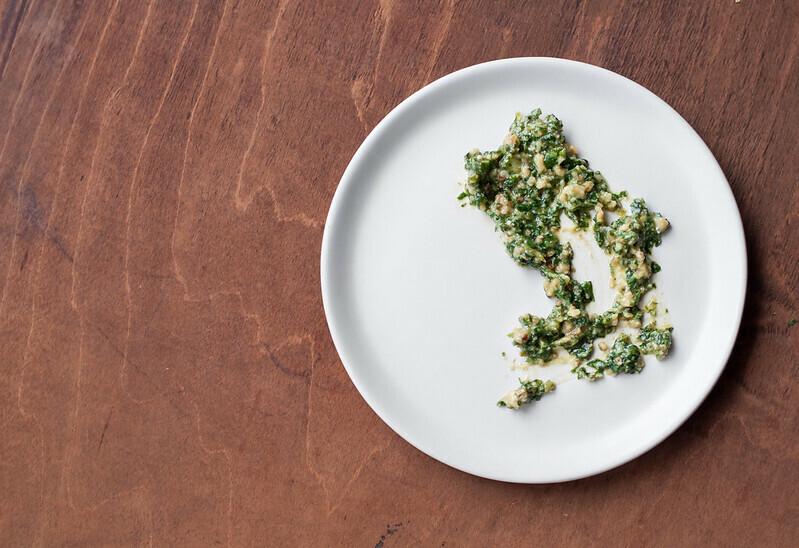 Maybe you want to save some of the pesto for a soup or other dish–it’s up to you. From what I’ve found, leftovers keep well for at least a couple of days, but I wouldn’t recommend freezing because of the high water content of the squash. Allowing the squash strands to drain in a colander while you finish the other components isn’t essential, but it will make leftovers much less soggy (or, as I’ve discovered, not soggy at all). For the prep-time conscious, the entire dish can be readied while the squash roasts. Yes, if you’re starving, chopping your own pesto can seem tedious, but you have to do something while the squash cooks, and it’s either playing with kitchen tools or folding laundry. While the point of the recipe is kind of the delicious pesto, if you just do not have the time or desire to chop a bunch of parsley into miniscule particles by hand, I think the combination will still be yummy using jarred pesto and a squeeze of fresh lemon juice. There's a certain sense of satisfaction in making this pesto by hand, not buying it in the store or using a bright, shiny food processor. You control the balance of flavors (use the recipe quantities and go from there) and are guaranteed freshness. After cutting off the stem, halve spaghetti squash lengthwise and use a spoon to scrape out the seeds. Rub a thin coat of olive oil on the exposed flesh and sprinkle moderately with salt and pepper. Turn cut side down in a 9x13 or half sheet pan and add 1 tablespoon water to pan. Roast at 350 degrees (F) for 35 to 45 minutes, until the skin is slightly tender to the touch. Turn squash face up in pan to cool. 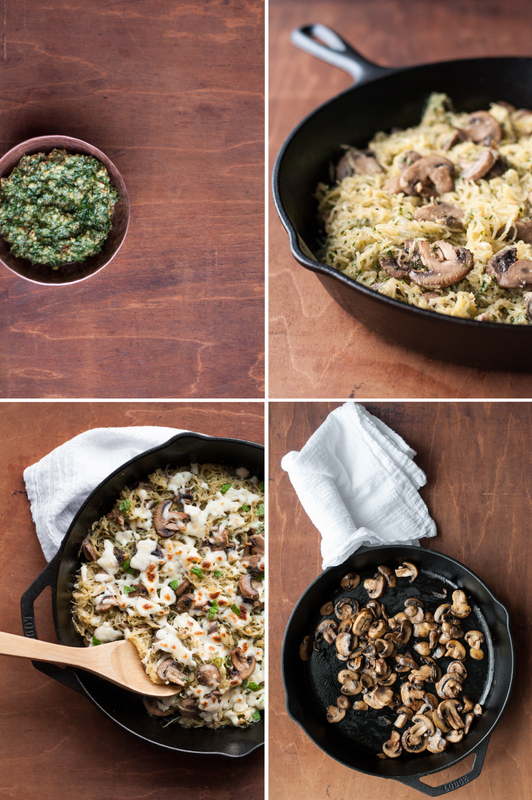 While squash bakes and cools, prepare mushrooms and pesto. Heat medium cast iron or other oven safe skillet over medium on stovetop; add 1½ tablespoons olive oil and heat until shimmering and fluid. Add mushrooms and stir to coat in oil. Cook about 10 minutes, stirring only every 2 or 3 minutes, until tender and liquid has evaporated completely. 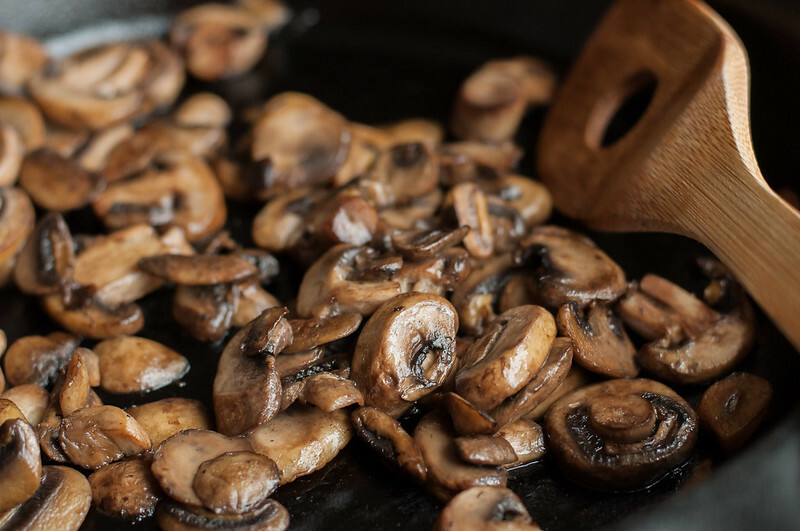 Leave mushrooms in pan. 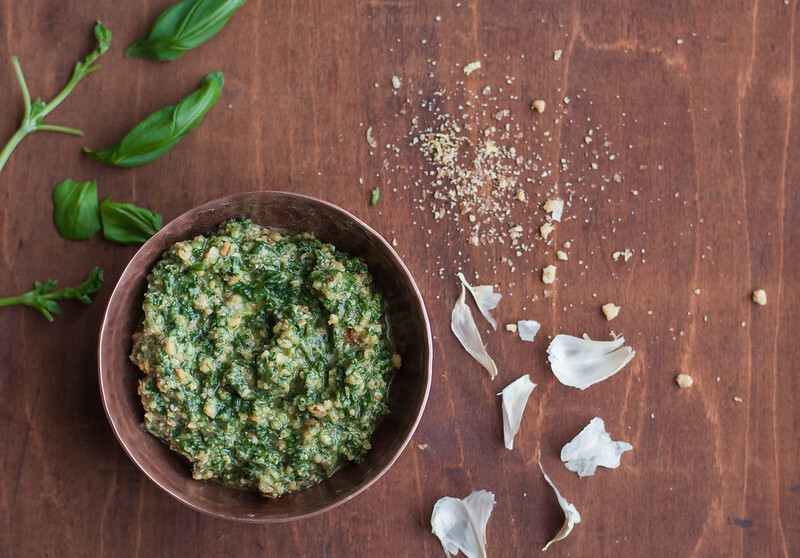 To make pesto, combine herbs and 3 tablespoons olive oil in a ramekin or other small bowl. Stir in garlic, lemon zest, and lemon juice. Place nuts in a new freezer bag, lay flat between 2 layers of dish towels, and use rolling pin or canned food item to smash nuts to a near powder. Because you're crushing the nuts by hand, the mixture won't be perfectly uniform--a few larger chunks add welcome texture. Add crushed nuts, parmesan cheese, ¼ teaspoon Kosher salt, and a pinch of ground black pepper to the herb mixture and stir to thoroughly combine, until it resembles a thin paste. Adjust seasoning if necessary. Working in the pan used for roasting, scrape "noodles" from spaghetti squash skins with a fork and discard skins. If time permits, place noodles in colander in sink and allow to drain for 5 to 10 minutes, or press with the back of a wooden spoon to speed the process. Noodles don't need to be completely dry, but removing some moisture will make for better leftovers. 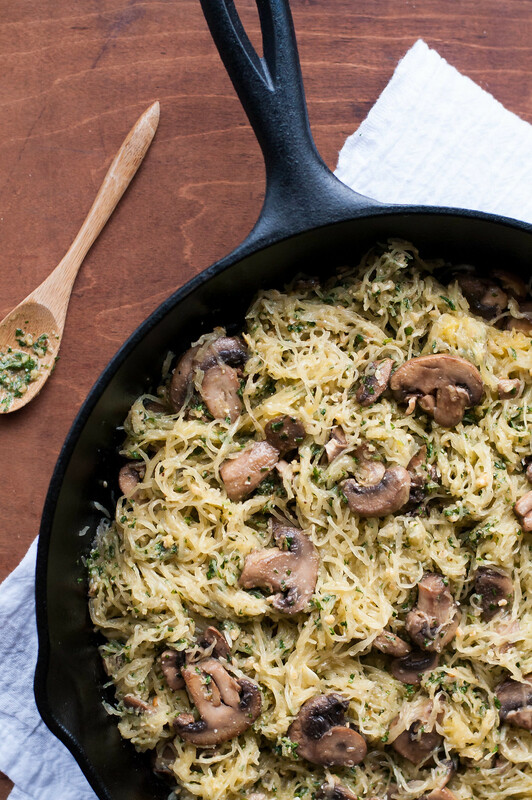 Add squash noodles and pesto to pan with mushrooms and stir to combine. Taste and season with salt and pepper, if needed (will depend on the seasoning in pesto). 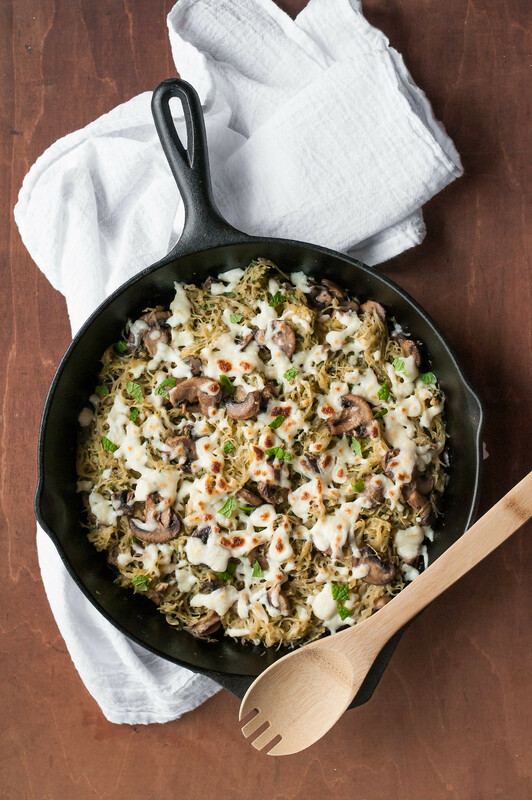 Serve warm as is, or top with grated mozzarella and broil a few minutes to brown cheese (be sure your pan is oven safe!). Be careful handling the hot skillet fresh from the oven. To make it vegan, substitute nutritional yeast for parmesan in the pesto, or just leave out the cheese. I tested the nutritional yeast version, using a 1 for 1 substitute for the quantity of parmesan, and I could barely taste a difference. If you're uncertain about the size bunch of herbs to buy, you'll need about 3 C of leaves. Cooking quality olive oil is fine for sauteeing the mushrooms and coating the squash, but consider a higher quality olive oil for a better tasting pesto. Since the most expensive oil on the shelf isn't always the best, try finding a specialty olive oil or foods store for assistance. My local store also sells online. Total recipe time is just under one hour. There's plenty of time for all other prep while the squash cooks. Pesto recipe yields about a cup. You can easily use it all with the squash, but feel free to go light on pesto and save some for other uses. Definitely need to get my hands on some spaghetti squash so I can make this dish. I just love how healthy and delicious it is – the perfect recipe to counteract all the Christmas unhealthiness!